Welcome back to the latest instalment of my Edinburgh City blog. After flying high so far in League 1 can we keep the pressure on and avoid the League 1 relegation playoffs? If you missed the previous post in this series, do go back and read it by clicking this link. 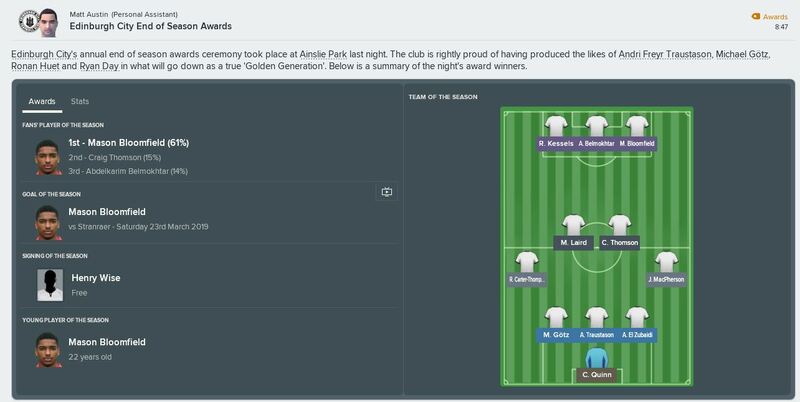 The start of this month saw none of our players in contention for the League awards and I didn’t receive any recognition in the manager category either, a poor month on the field certainly didn’t help. The start of the month saw us travel to Dumbarton. A great start as we walked away 3-1 winners. Belmokhtar and Bloomfield continued their great pairing by grabbing a goal apiece with Thomson getting the third. Another away day with the trip to Forfar next on the agenda. Another great win, this time coming from behind to win 2-1. Belmohktar grabbed himself a great second half brace and the Man of the Match award. Hopefully the form will continue in our upcoming home games. The first of two games at home saw East Fife arrive at Ainslie Park. A 2-0 win with Belmokhtar and Bloomfield scoring our goals was a great start and a nice clean sheet for Quinn only added to the win. Our next result, a 3-1 win, saw us break our bad run against Stirling. Bloomfield bagged a brace before Kessels wrapped it up in the 91st minute. February has been a great month, our strikers are scoring for fun and the defence hasn’t been disastrous. Hopefully this run will push us forward in our attempt to avoid the relegation playoffs. This months player to watch is Craig Thomson, the Scottish midfielder has been ever dependable in the heart of the midfield. Alongside his help defensively this month he has also contributed offensively with 2 assists and a goal. Not too bad for the converted wing back! March began with me taking the second place award at the Manager of the Month ceremony. It’s another bit of silverware to add to my collection, it’s always nice to be recognized. Down to the business end of the season and we start with a tricky away day at The Falkirk Stadium. A great first half with goals from Bloomfield, Belmokhtar and Kessels provided a much-needed win over championship chasing Falkirk. Bloomfield again picked up a little niggling injury, his fitness is really starting to be a concern as he can’t see a game out. Another away day this time against Queens Park. Another win and another 3 goals scored. Belmokhtar got us off to a flying start in the first half, coupled with second-half goals from Thomson and Bloomfield meant that the victory never seemed in doubt. Bloomfield started on the bench in this game and still managed to net a goal, hopefully he will be able to continue this form even with his fitness issues. I guess this is part of the problem of being a part-time football club. Another away match, the third on the bounce, saw us travel to Alloa. 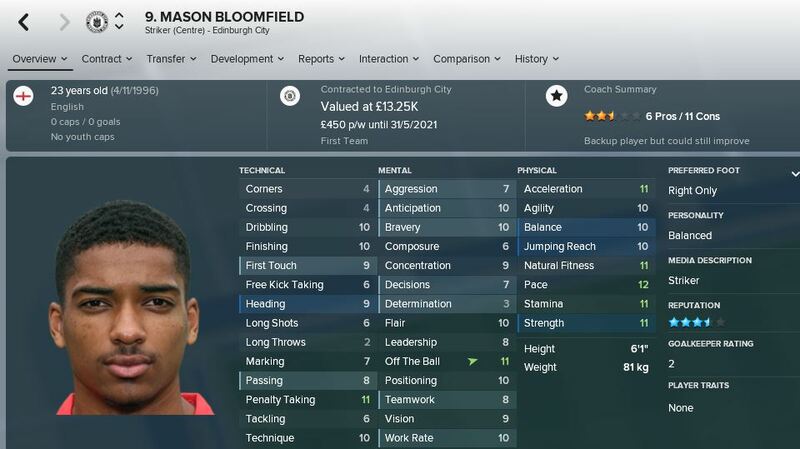 Dropping Bloomfield to the bench in the last game must only have spurred him on as he scored both the goals in our 2-0 win. Luckily for us his shooting boots were well and truly laced as Kessels went off injured with just 12 minutes gone. Arriving back home at Ainslie Park resulted in our first dropped points of this post. A 1-1 draw against promotion contenders Stranraer. 90 minutes separated Bloomfield’s opener and Galt’s equalizer. We just couldn’t hold on for that vital win. This months player to watch is Mason Bloomfield. He has already featured in a previous post but having scored in all 4 outings this month its hard not to notice him. As I’ve mentioned more recently his fitness has struggled of late but can still score from the bench, with this happening on more than one occasion this month. March’s player to watch helped himself to second place in the Player of the Month award falling just behind winner PJ Crossan. Bloomfield has been an integral part of our strike force adding to the cause with 5 goals in March. I also managed to pick up some more silverware, this month it was a ‘1st place’ trophy. I finished ahead of Falkirk boss which can only have been helped by our great 3-2 victory at the beginning of the month. April saw us into our last 6 games of the season. To start the month off Airdrie arrived at Ainslie Park. They left with their tails between their legs after a 5-2 defeat. Bloomfield and young Greek striker Sanidas both grabbed braces with Belmokhtar rounding off the scoring. A great start to the end of season run in. Staying at Ainslie Park, the visit of Dumbarton proved to be less fruitful. A hard-fought 1-1 draw saw us come from behind to take the point. Bloomfield added to his tally late in the first half to add to his seasons tally. Another home game and another hard fought game, this time we came out on top against Forfar, Bloomfield providing the only goal of the game. Back on the road to East Fife. A slightly disappointing result in a 2-2 draw. We left with only a point after a Belmokhtar brace seemed to have clinched it only for East Fife to score a last-gasp equalizer. Gutted. That’s it for April, two games to go until we find out our final league position. Are we safe? This months player to watch is Belmokhtar. He has scored three and assisted in 4 of the goals scored this month. A mainstay in both his seasons with us, hopefully he will stick around and he isn’t tempted away from us by other clubs. Take a bow Mason Bloomfield. He has yet again taken home an award. Third place in the Player of the Month award. Adding another 4 goals to his season total which in turn has helped his team massively. Well done Bloomfield. I also took second in the Manager of the Month award. I’m more than happy with second place, especially after only winning two of the 4 games last month. So the last two games are here, first up the away trip to Stirling. A great 5-2 away win was not what I had expected. Our young Icelandic defender scored a great brace alongside a second-half double from Belmokhtar. This had wrapped up the points before Kessels scored the fifth. A great win against one of our personal bogey teams. The last game was against promotion favourites Falkirk. We went into the game hoping to give the Ainslie Park faithful one last thing to cheer about. It wasn’t to be as a disappointing 1-0 defeat to Falkirk ended our season. Ryan Hardie scored in the 7th minute and we never really got a foothold. So that’s it, the end of our first season in League 1. So, let’s find out how we did! So I’ve been keeping the league table under wraps so far this season. I try not to look at the table throughout the season as to not give myself false hope. The exciting news is, we won. Edinburgh City will play Scottish Championship football next year. This has been a great season for us, I’m really pleased with back to back promotions for our little club from Edinburgh. A great 6 point gap over our nearest rivals Falkirk. Fantastic for everyone involved. Bloomfield unsurprisingly took all the awards available to him at our end of season awards. We have been brilliant and everyone in our Team of the Season thoroughly deserve to be there. Our Overall Best Eleven saw a huge change in the team, unsurprising after only 2 seasons. Only two players from our League 2 season keep their places in the team. An impressive season and one that highlights the true potential of our little club from Edinburgh. Can we take our team all the way to the top tier of Scottish football? We’ll have to get past the Championship first! This series is written by Joe and is his first series on VivaLaVidaFM, so do leave some comments below if you have any advice! And be sure to follow Joe on his Twitter linked here. 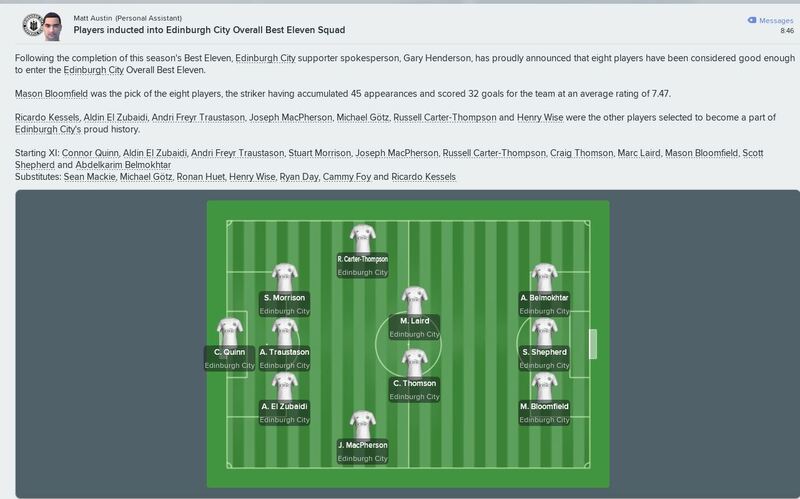 This entry was posted in Edinburgh City | @LittleJoe54321, FM18 Stories, Football Manager 2018 and tagged Edinburgh City | @LittleJoe54321, fm stories, fm18, football manager, scotland, scottish league one. Bookmark the permalink.